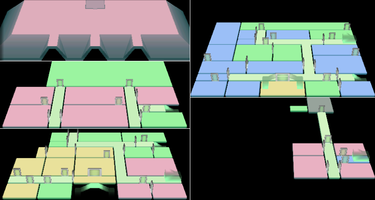 The Sealed Room is an optional room in Area Four of Luigi's Mansion. Luigi can only enter the Sealed Room from the rightmost chimney on the Roof. 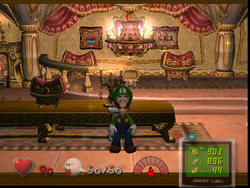 Inside the Sealed Room are several treasure chests that Luigi must open to continue. One chest in the back of the room releases a Gold Ghost, a Purple Puncher, a Blue Twirler, and a Purple Bomber. After capturing all of them, the Key to the Sitting Room materializes. Upon receiving the key, Luigi finds that the Sealed Room is, in fact, sealed from both sides. To escape, he must use the mirror hidden under a cloth in the back of the room to return to the Foyer. In the PAL Hidden Mansion, the treasure chest releases eight Purple Punchers. The Sealed Room contains two treasure chests and a vase along the west wall, a table with a treasure chest near the south wall, a treasure chest on the floor near the table, four treasure chests and three vases along the east wall, and up the steps are a low-hanging chandelier as well as three additional treasure chests and a mirror. This room, like the Hidden Room, sparkles with a shimmer of gold dust. There is a Speedy Spirit inside the chest nearest to the table. In addition, there is a 20% chance a Gold Mouse will spawn the moment Luigi enters the room. This is the only room that has no exits (besides the mirror warp). This page was last edited on February 18, 2019, at 12:00.